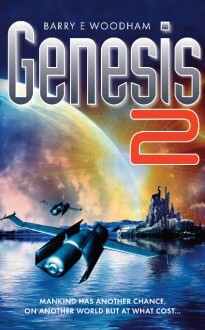 In Genesis 2 the Genesis Project spread mankind to the stars using Nano-ships before the sun expanded into a red giant. As immense periods of time are needed to travel at sub-light speeds across interstellar distances, the ship’s artificial intelligences are shut down to save energy. One ship becomes caught amongst the comets in orbit around the sun and stays trapped for over six million years. The ship’s random orbit is disturbed and the crew re-activated by the increased energy levels as they fall towards the sun. The old civilisation is long gone and Jupiter is teeming with natural and seeded life. The world is no longer a gas giant, as the expanding sun tore off most of the miles deep atmosphere. A massive mountain range divides Jupiter and on one side lives a sentient species known as the Gnathe. These people control their world by manipulative genetic engineering of their own people and the creatures that they find useful. On the other side of this mountain range live the re-created humans and intelligent apes and when they interfere in the affairs of the Gnathe a chain of events is set in motion that will forever change both societies.